Let me start by stating that I’m loosely using the term ‘race’. I ran the race with my friend Becca, and we used to run together all the time. We were roommates in college and then ended up living in the same city years after we graduated. And we’d get together to run. A lot. We also used to run a lot faster than we do now. Age, pregnancy, kids, injury and lack of competitive running goals all factor in to our current running fitness. We definitely didn’t intend to ‘race’ this 5k! Our goal was to have fun, run together and catch up. We had a great time. 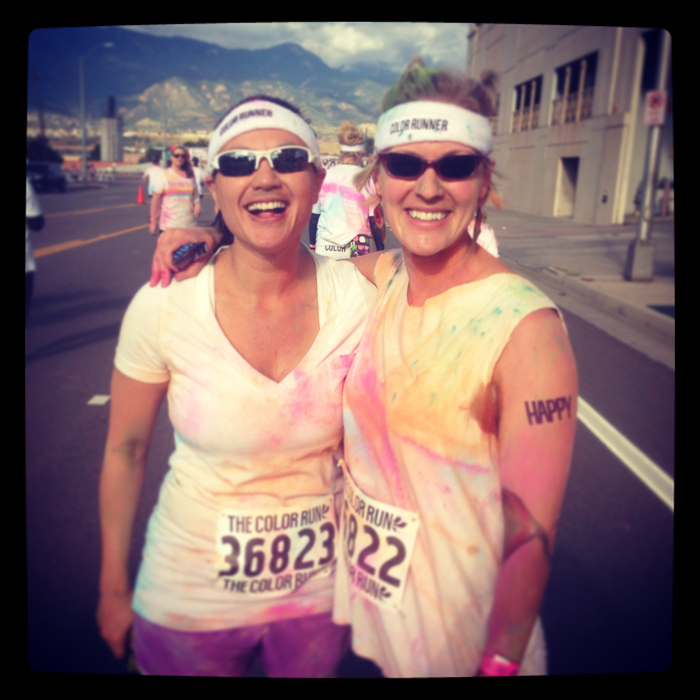 And really, the Color Run says that its the “happiest 5k on the planet”. How could we not have a great time? The weather was perfect – a rare 4 hour window where it wasn’t raining. (I’ve lived in Colorado for 9 years and the past few days I think we’ve received 9 years worth of rain in 5 days.) This race is so low-pressure that I didn’t even see a timing clock anywhere. Volunteers threw paint on us at various color stations along the course. Fun. Fun. Fun. Looks like it was a lot of fun! They did one on the street in front of our neighborhood earlier this summer and the people throwing the color seemed to have the best job! We had a GREAT time. And yeah, the paint throwers had the best job I think 🙂 Despite scrubbing and scrubbing, I still had paint on for a few days afterwards.